Super Hero Boy: ShooShoos are not just for infants! ShooShoos are not just for infants! We miss the days of those soft little leather shoes that Connor wore every day when he was an infant. We still have a few pairs but unfortunately for the most part he has to wear shoes with waterproof soles as he spends a good amount of time outdoors. 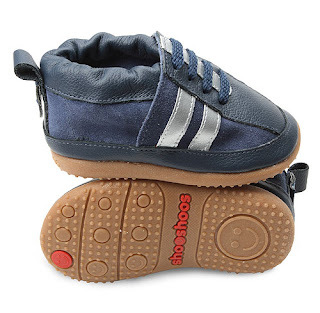 ShooShoo's Smiley Light Flexi Rubber Soles look and feel like soft soled shoes from the top but the bottom hides a fully flexible light weight rubber sole that will protect little feet and hold up to outdoor wear and tear. Connor received a pair of the Denim/Silver Smiley Sports which he loves as much as I think they are adorable. With no velcro and no laces they go on just the same as a traditional soft soled leather shoe. Elastic secures them on around the ankles and keeps them on no matter how much jumping and running goes on. Connor can easily slip them on, but what I really appreciate is they are harder to kick off than a standard shoe. Connor has this awful habit of just removing his shoes every single time we get into the car and he has to work a lot harder to get his ShooShoos off which usually deters him from trying in the first place! At $24.95 a pair they are very affordable as well! Visit the ShooShoo's website for more information and to see all the adorable styles.